In the final hours of Michael Smith’s life, family rotated into the hospital room. Most had little to say and spent, on average, three minutes each wishing the man well and promising his full recovery. There was the inheritance to think of. Should Michael survive—as he always survived—it was important to be seen. There might be, like after the heart attack or the shooting in Lebanon or the car wreck in Mali, a revised will. When Michael did not recover, each relative commented how ironic his death was: that in a life lived so dangerously, a bacteria-laced tuna fish sandwich fell the man. Michael’s granddaughter, Samantha, refused irony as an acceptable explanation of death. She, like her grandfather, was an artist—not a photographer, but a sculptor (a student sculptor). She was also Michael’s favorite living relative. In her last visit with the-then-conscious Michael, Samantha entered the white-walled room alone. She had only known her grandfather as a virile man, but there he was, unshaven and emaciated. He lay impotent on a hospital bed opposite a cheap print of Georges Seurat’s A Sunday Afternoon on the Island of La Grand Jatte. In her final ten minutes with the photographer, Samantha opened the curtains. Samantha pulled a chair close and watched her grandfather’s face. He stared at the ceiling. Samantha stood, walked to the door, and flipped the light switch. Shadows, black and precise, appeared on the man’s face. In the areas of the room unclaimed by shadow, color glowed. Everything with yellow in it—the cushion on the chair or the hand soap bottle on the sink—radiated. Samantha’s green coat was vivid as grass after rain. “The magic hour,” said Michael. “Hurry,” he said. His jaw twitched. Michael’s breathing was interrupted and irregular. He seemed to be steadying it, tightening his neck as if holding back a yawn. “The nose,” Michael said. He closed his eyes. “Tell me about Andy Warhol, again,” she said. “Tomorrow,” he said, and then coughed, and a gelatinous mass of moss-colored mucus hung on the hollow beneath his bottom lip. Samantha’s mother, Lisa, assumed responsibility for funeral arrangements. Lisa was Michael’s eldest and the most capable of reconstructing her father’s biography. She noted his service in Vietnam, his decorated career as a photographer and war correspondent, his happy and (relatively) long marriage to her mother Angela (though omitted Janet, Michael’s first wife, or Leah, a woman scheduled to fly from Barcelona to be at the funeral. Lisa sent her the wrong date). Lisa described Michael’s work as a photography instructor at a local college. She listed his surviving relatives (three siblings, two daughters, one son-in-law, four grandchildren, five nieces, three nephews, and fourteen grand-nieces/nephews) that he, according to Lisa, loved very much. She named those who had preceded him in death: his parents, his twin brother, and Angela. She wrote this, as eulogies are written, with selective honesty. Perhaps Michael had loved his family—in his own way. Samantha let herself into Michael’s house with a key he had given her four years earlier, one she had always meant to use while her grandfather was living. She planned, at some point, to visit with him for a week or two. In her grandfather’s office Samantha found boxes of photos from 1960s New York, images of Detroit from the ’80s, and a series on Nebraska farmers. One box was dedicated to Angela. Toward the front were standard snapshots, with Angela standing before landmarks: the Grand Canyon, Radio City Music Hall, and an anonymous Greek amphitheater. These were followed by candids of Angela around the house or gardening. There was a series, a full roll, taken in the kitchen. Samantha stopped on a shot of the woman, probably in her mid-thirties, staring out a window and eating a bowl of cereal. The series started as close-ups, the early pictures showing a bashful, reluctant Angela. But Angela began to ignore the camera. In the final shots, her face relaxed. Her eyelids were heavy and her lips tight and closed. The first real wrinkles were in that photo. Samantha found nudes. She thumbed through them quickly and the effect was something like an early silent film as an athletic woman transforms from reluctance to playfulness to confidence. In the final three shots, Angela looked into the camera: through it, at the photographer. Her hands perched on the tops of her hips, her elbows jetted out like insect wings. Samantha had not asked permission (and had no plan to), but she started a pile, a set of photos she would claim as her own. She hoped no one would notice. There were already whispers about the division of the Smith estate: “How much do you think he’s worth?” Some of these covetous little murmurs brought up the value of the photos (for historical interests, of course), images shot by a man who had published six times in LIFE Magazine. Samantha pulled out several of the Angela images, including all the nudes. She re-examined them as she set them in a box she would take, hiding her grandmother from family members who might not be so protecting. She studied the woman her grandfather had loved. There were similarities in their bodies: the same boyish hips, the same deep clavicle, and the same small and unpronounced areolas. Samantha was most intrigued by the final shot in the Angela box: a woman in her mid-to-late-fifties, the same age as Samantha’s mother, given over to her observer, with arms raised and eyes closed. This was how she looked before the end. Samantha could not find any images of the sickness. And Michael was still absent. Samantha opened one of the oldest boxes: shots of monochromatic American soldiers in a Vietnamese village. A few prints were inscribed with dates or names, but not many. After the soldier pictures was a set of frantically composed shots of burned children. There was no clear sign of how Michael had organized the box: place or time or subject. But Samantha flipped through it with much more speed—and much less pleasure—than she had with Angela’s box. The static, composed happy soldiers gave way to blurry but penetrating images of burned houses, weeping men, and limbless animals. An ancient Vietnamese woman stared at the photographer, her face blank as a death mask. The most remarkable discovery, as Samantha considered it, was the series of albums stored in a bedroom closet. There was no image of Michael to be found, but there was a carefully organized collection of boxes, each labeled with spans of months (Sept–Dec, Jan–Mar). Each box contained albums of 4-by-6s, which were labeled with masking tape and a felt-tip-marker inscription of a family member’s name and birthdate. Samantha pulled out the boxes and flipped through the albums. Some were thin. The younger great grandnieces/nephews only had a couple shots each (baby, toddler). Some albums held decades of images. Samantha opened the album labeled, “Lisa Ann 10/31/60,” and thumbed through as her mother become a teenager (1978 was missing). Lisa turned into a pretty but distant twenty-something, then gradually swelled into mid-life, and finally settled into the desaturating hair, which oxidized from rich black to faded charcoal (every photo, except 1977, 1979, and 1991, was in black-and-white). The album was a summary of the woman, a version of a mother with facets that the daughter did not always recognize. For Samantha, consuming the album in one sitting was like staring at the cross section of a tree, with each line signaling a year’s worth of drama and pain and joy: fires and great rains and diseases and parasites and sunshine represented by a single circle. It was too fast and too dense. Samantha hesitated to turn toward the unfilled album pages, fearing she would see her mother of the future—60 or 70—fade from life. Samantha faced her own unflinching mirror, absorbing twenty-four uninterrupted years with the turn of thirteen pages. She was a happy and thoughtful child, or so her grandfather recorded her that way. She was a resentful preteen and a detached adolescent. She was a strong—maybe obstinate—young adult, always dressed in solid colors. The Samanthas of 1996 and 2008 seemed happy. The Samantha looking at them did not remember why she might have been. Samantha set the album in a box with the Angela nudes. No new photo of Michael surfaced, and the lack of a post-Korea sighting fascinated the Smiths. Michael became the family Bigfoot. Uncle Paul offered a bounty of $100 to anyone who could find (other than a driver’s license or passport photo) a clear image of Michael taken in the last fifteen years. Paul sent a subsequent note saying that the bounty would apply to a driver’s license or passport, as these items were mysteriously absent from Michael’s belongings. Paul added that whomever had them should return them to the family: no questions asked. Samantha had not taken them. Samantha was saddened by how, again, irony was used to explain what should be inexplicable: that the man who could show—by the very existence of his photographs—that he was present at graduations, weddings, retreats, basketball games, barbecues, and dance recitals was never recorded. This man was altogether absent from the negligent devices of the people he chronicled. Michael Smith had the same relationship with his family that he had with the burned Vietnamese children, with the refugees in the Sudan, with the woman he caught pulling up her stocking on Christopher Street in Manhattan. What made this all more damning to Samantha was that she, apparently, was no different than her dismissive Uncle Jonathan or her infant cousin, Trina. There was not—on her computer, in boxes in her closet, in old albums—any direct evidence of a man whom she grew up adoring, the person who brought her into the desert hills to teach her to see light. There was no record to show that she was closer to her beloved grandfather than some stranger in Belgium, some corporate CEO on Wall Street, the weathered woman in a napalmed rice field. Samantha ordered Chinese take-out, turned off her phone, and uncorked a bottle of red wine (Papa never believed in wine with screw tops). She disappeared into her makeshift apartment studio. She sat before her final, an in-progress sculpture, and removed the plastic sheet and damp rags. It was an abstract, something that (depending on the viewer’s angle) resembled either a stone gray Victorian chair leg protruding from a gopher hole or an angry demon escaping Hades. This was the final project, and it was due in a day. Samantha punched the sculpture. It crumpled. She filled a small bowl with water and unrolled the tool satchel and tried, through a series of cuts and pushes, to recreate something of her grandfather. The effort was fruitless, with each hour’s work ending in little more than one more empty glass of wine. Samantha hit the clay and smashed it back into a featureless mass and started again. Hour after hour, repeating the sequence of drinking, rejecting and balling a mound of clay, and understanding that she had lost either her ability to sculpt or to recall her grandfather. She would fail her dear Papa and, likely, her studio course. Her hands dried. Slivers of clay peeled off like parched reptile scales. Samantha replayed the apocryphal tale of Michelangelo whittling away at a block of marble. The old master removed anything that wasn’t King David until a masterpiece emerged. “Screw Michelangelo,”Samantha said to the clay. She bashed her opus, chugged the last trace of wine, and closed her eyes. “Tell me about Warhol,” said Samantha. Samantha woke an hour before sunup. She was sore, having spent two hours on her studio floor, feeling the dark, pulsing headache that followed indulgence in supermarket-label wine, even wine with corks. The lights were still on, and they blanched the lightening gray clay that represented six failed attempts to evoke Michael Morton Smith. Samantha sat up and pushed the clay off the table. She stood and, after a percussive set of neck creaks, moaned and left the studio. She walked into her room and slept atop her bedspread until the sun cut through the blinds in the morning. The contours on the bedspread captured the light. The wrinkles and bends became peaks and valleys in a great magenta-and-purple range where white hibiscus flowers served as glaciers. Samantha flattened the mountains with a ruthless slap, changing the face of the cotton earth like a Roman god throwing a tantrum. She returned to the studio. It smelled like mud. Samantha emptied and refilled her water bowl and unwrapped fresh clay. She turned off the studio lights and opened one set of blinds, the sun hitting the clay and the table. She found the rough beginning of a bust: a haphazard, perhaps, set of shoulders and neck with a small half head perched on it. She worked unconsciously, observing how the sun responded to the clay and how some shadows were Papa-shadows and some were not. She built on those shadows she recognized, appending small tapioca-sized balls of clay like dirt from Eden. In an hour, something resembling Michael’s bone structure emerged. The sun shifted, and Samantha turned the bust to follow it. She found Michael’s forehead, the optical cavities, the contour between his eye and the peak of his nose as it dipped and flowed out of the forehead. Piece by piece, she added. It was rough, but it was true. The second hour passed and the nose arrived. Samantha shifted to the light again. Her head throbbed, and she needed food. She needed water and a toilet. She needed to shower and dress before class, but if she moved now, she would never find the light again. She worked through the third hour, through class (she could fire off an email afterward, perhaps, and say something came up—her grandfather really did die, after all). The lips came in. Michael still needed ears and hair, and Samantha needed desperately to stop, to get out of the house. But the light would not shine this way again, and if Samantha left it, she may as well throw the clay onto a wheel and spin an ashtray. She finished the ears and the hair. They were hurried and could use more nuances, more detail, but they were, even in the abstract, Michael’s ears and hair. Samantha struggled with the eyes, but found the sense of them: active, alive, hungry. On campus, class had ended, but in Samantha’s apartment a man’s chin was becoming. Samantha sharpened the jaw line using flecks of clay, building the small hint of the round chin bone until a sketch of Michael was before her. He was younger than the man in the hospital, perhaps someone Andy Warhol might have recognized. Samantha rushed to the bathroom and peed. She brushed her teeth and caught a fleeting and unflattering image of herself in the mirror, but ignored it. She returned to the studio to see if the sculpture still looked as it did when she last saw it. Samantha lifted the Masonite board holding her grandfather’s bust. She set it and the sculpture in a milk crate and carried them to her car and drove to the art building, hoping that she could still get partial credit for a late assignment. She turned corners with gentle acceleration. She was careful not to frighten the passenger on her front seat. She asked him what Andy Warhol was really like. She asked him how he got Angela to take nudes. By some act of divine grace, Samantha found parking close to Jacobs Hall. She turned off the car, exited the driver’s sided, walked to the passenger side, lifted the crate from its seat, and closed the passenger door with a nearly balletic hip thrust. She lifted the crate eye level. She peeked at her grandfather and smiled. She felt the cross-generational bond, the redemption of hospital light on a dying man, the pride of being the only Smith to really know the photographer. She was the last witness to Michael Morton Smith. Yet when—the combination of sleep deprivation, urgency, hangover, and a high curb—she dropped her grandfather, Samantha thought first about her failing grade. The statue’s nose was dented as if Papa had abandoned photography for pugilism. The cheekbone broken, the lips merged, and the right eye socket collapsed. Maybe this is how he looked after one of the car wrecks. Across one side of the face, there was the texture of the sidewalk from temple to cheek like an exotic skin disease. Samantha almost cried. But she retreated, instead, to her favorite swear words, cursing the ground as if it were a negligent barista. When she got to the building’s studio, Samantha smoothed and cut, evening out some of the damage, rubbing water across the sculpture’s surface, smoothing the skin like a Beverly Hills surgeon. But the clay had hardened. Samantha could not revive it. Michael Morton Smith was lost. Samantha’s comfort was that her professor wouldn’t know what the statue was supposed to look like. There was no picture for comparison. The 11×14 enlargement of a military man, a young disinterested soldier who had been drafted to Korea, was glued to a piece of foam board and stared dutifully from a wood easel between the casket and the podium. Lisa gave the eulogy. It was a cluttered stream of facts and events, little anecdotes about the time Dad got back from Israel and brought home a vial of water from the Jordan, the time Dad stole a pen from President Ford. He was a great man, all could agree. Lisa never looked into the open casket, only at the photograph of a young soldier. Samantha pictured her mother as the thirty-year-old from the closet album. Then the twelve-year-old left home while her parents partied with artists. Then Samantha saw her mom as the woman she was now: fifty-five, competent, and sensible. Samantha wondered what the magic age was, when life becomes so fixed that you stay married to a man you only tolerate, go to a job that you feel trapped in, wear clothes that subdue not elevate your breasts, describe your father in the past tense without weakening. Samantha kept her eyes fixed on her mother, on the faux pearl necklace and the gold brooch-like earrings, the shorter-by-the-year hair that was split down the middle and lightly feathered. She studied the skin under fluorescent lights, the shadowless and washed-out rises and ridges that could make a human face look like a moon. She saw, for the first time, the resemblance between Morton Michael Smith and the family he left behind. Joseph JP Johnson writes fiction and poetry. 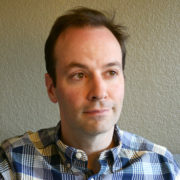 His work has appeared in Flash, Heron Tree, Rust+Moth, Aethlon, and The Santa Clara Review, among others. He has won the Editor’s Choice Award for Carve Magazine and was a finalist for Fiction Southeast’s Ernest Hemingway Flash Fiction Prize and the Ruby Irene Poetry Chapbook Contest. He is currently completing an MFA in the Rainier Writing Workshop at Pacific Lutheran University.